Dronnadula V. Reddy (D. V.), Ph.D., professor in the department of civil environmental and geomatics engineering and director, Center for Marine Structures and Geotechnique at Florida Atlantic University recently released his textbook "Essentials of Offshore Structures: Framed and Gravity Platforms," co-authored with A. S. J. Swamidas. Essentials of Offshore Structures: Framed and Gravity Platforms examines the engineering ideas and offshore drilling platforms for exploration and production. This book offers a clear and acceptable demonstration of both the theory and application of the crucial codes of structural, fluid, and geotechnical mechanics to offshore structures. It makes available a multitude of "solved problems" and "sample problems to solve" which give readers a strong understanding of the analysis and design of steel-framed and base-supported concrete gravity offshore structures. The book highlights sensible engineering applications for offshore structural design, research, and development; it can also be useful to those working in the design industry. Separate chapters detail the factors that influence the pile embedment and concrete gravity foundation characteristics, material choice including fatigue and corrosion, estimation of ocean environmental forces that will be exerted on the offshore structures, and the analysis fundamentals that the reader needs to possess. The last two chapters give detailed insights into the analysis and design of framed and concrete gravity platform offshore structures. Overall, this book is a comprehensive presentation of the analysis and design of steel and concrete offshore structures. 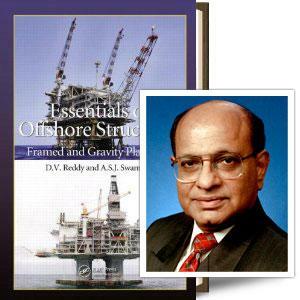 Reddy has taught courses on offshore and coastal structures for over 30 years. His research interests are in the areas of marine structures, materials, and geotechnical engineering, with particular focus on concrete technology and computational/analytical mechanics. He is a Fellow of the American Concrete Institute. He has authored over 370 papers, two books, edited three conference volumes; and been recognized by a number of awards. Select here to read more.